The Planar brushes add the ability to flatten parts of your model, without creating overlapping geometry. By default, these brushes will flatten everything which is at the clicking level and aligned with the brush angle, by doing a click drag: if you click inside a cavity, everything which is above the click depth will be flattened. This means that if your click is on the top of a peak, nothing will be flattened as your cursor is already on the top of the model. The Imbed slider in the Brush >> Depth menu controls the depth of the stroke when using the planar brush. 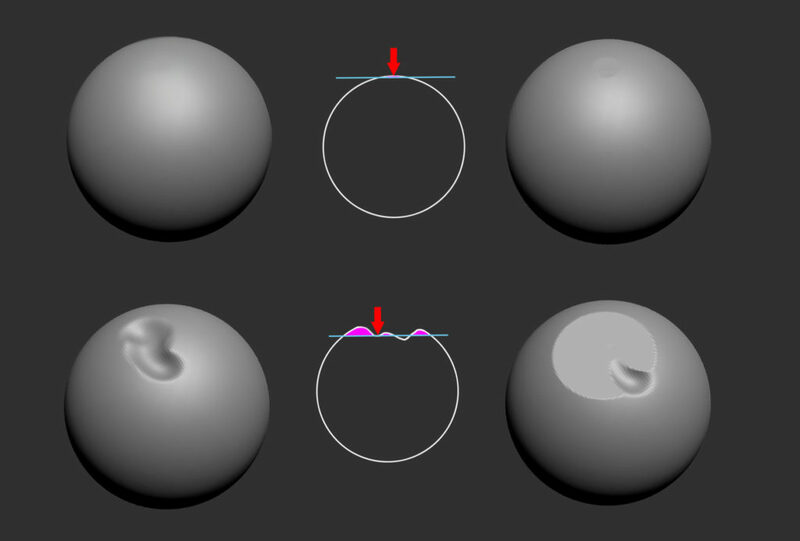 Showing how the Planar brush only removes material that is higher than its starting point, so that the plane formed by the starting facet is extended. The red arrow shows the point where drawing is started, the magenta area is what material is removed. The Planar Cut brush (available in Lightbox in the Planar folder under the Brush tab) cuts a plane at the tilt and depth created at the beginning of the stroke. The depth can be increased by repeated clicking of the cursor at the start of the stroke, or by changing the Imbed value in the Brush Depth submenu. Working outwards will extend the plane. The Planar Cut and Planar brushes work well together. The initial plane angle and depth is created using Planar Cut and then the Planar brush used to complete the plane. Using the Planar brush gives more control than using the Planar Cut on its own. The Trim brushes are based on the Planar brushes but provide a different behavior based on the normal of the surface or the screen working plane. Compared to the Planar brush which are restricted to a clicked point on the surface, or a defined path, the Trim brushes do not have these restrictions by default. These brushes will allow you to sculpt hard surfaces in a freehand way. The Polish brushes smooth, flatten and shine the surface so that it resembles polished metal.